Happy Comic Book Release Day! Welcome to another installment of GeekMom Comic Book Corner, where we recap our adventures in comics for the week. 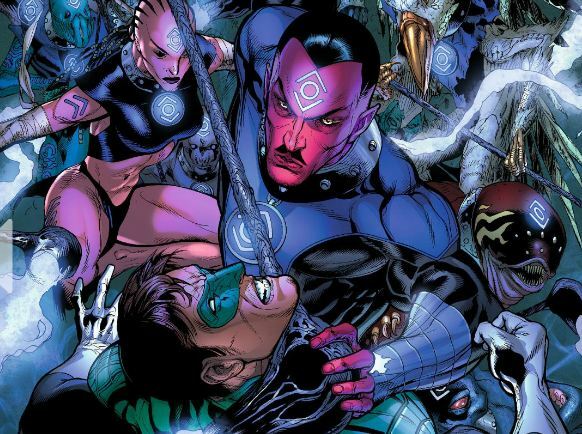 In the latest issue of the New 52 Green Lantern, we learn about the origins of the Indigo Tribe and how Abin Sur is connected to them. In his attempt to free Sinestro from the Indigo light, Hal Jordan learns more about Abin Sur’s connection to the tribe. We also learn that Nok means “compassion be with you” and is also the name of the Indigo Tribe’s world. Jordan learns that Abin Sur knew of the guardians betrayal to the lantern corps long before he died. The Indigo Tribe was supposed to be his army to fight back and save the Green Lanterns. After Jordan tells the the keeper of the Indigo lantern that Abin is dead, he becomes so saddened that he shuts down Indigo lantern. A major uh-oh in this was that now everyone held under the influence of the Indigo tribe’s power source was free. A really bad thing considering they are all the wicked of the wicked. I can’t wait to see what’s in store next month. It should be pretty interesting to see Jordan and Sinestro fight their way out of this one. The story of Buffy, Willow, and Xander continue in the pages of Dark Horse Comics in this first collection of Buffy the Vampire Slayer Season 8. The comic series picks up where the television show left off, with the Hellmouth and Sunnydale destroyed and a legion of Slayers under Buffy’s command. I can’t get over the gorgeous cover art included in the volume. The characters are completely recognizable in both look and personality, making me feel like the series never ended. If you’re a fan of Buffy the Vampire Slayer, give Season 8 Volume 1 a try. This hardcover edition will be released on May 30, 2012. I brought my daughter to my local comic shop, where I was flattered that the manager knew my name and pulled the books I’d pre-ordered before I even had a chance to request them. I have Arrived! This week I bought Mind The Gap #1, written by Jim McCann with art by Rodin Esquejo & Sonia Oback. It’s a multi-layered mystery with otherworldly elements. Jim previously wrote a book with artist Janet Lee called Return of the Dapper Men, which won an Eisner Award last year, and I’m proud to say I got to know Jim back when he first started at Marvel. So it is with complete and unreserved bias that I recommend his new book, which is probably best for teens and up. My other purchase was Takio #1 by Brian Michael Bendis and Michael Avon Oeming. Takio is an all-ages book about two sisters who are superheroes, published by Marvel’s Icon imprint. Very exciting to me to see an all-ages comic with two young female leads. Other comics I’ve been reading include Old Man Logan, by Mark Millar and Steve McNiven, with whom I’ll be working on an upcoming comic project; Rex: Zombie Killer #1 [ by Rob Anderson and DaFu Yu; America’s Got Powers #1 by Jonathan Ross and Bryan Hitch; and Cleveland, by Harvey Pekar and Joseph Remnant. All of the above are best for teen to adult readers, although Rex is more tender and less violent than the title might suggest. According to the end notes, the creators have been pleasantly surprised that readers have been sharing the story with their older kids. Writer Rob is the General Manager at Comics Experience, which offers classes and workshops in the field. As I mentioned in my last write-up, I recently saw the Harvey Pekar movie American Splendor for the first time since moving to the Cleveland area, where the film takes place. I was moved to discover that the scene where the lead characters see Revenge of the Nerds was shot at a movie theater in the neighborhood where I now live, and which has sadly closed down. Furthermore, my mind was blown by the discovery that the actor playing Toby the Nerd is the shockingly unrecognizable JUDAH FRIEDLANDER. I noticed his name in the credits, watch 30 Rock religiously, and still didn’t make the connection until I later stumbled on a mention of the role on Twitter. My mind is still blown. In other professional comics activities, I had a consulting call with a Comics Experience client to discuss a project he’s developing. I also received some copies of CLiNT Magazine #13, which features an interview segment with colorists, letterers and editors of comics from Millarworld, a media company established by comic writer Mark Millar. The CLiNT guys kindly included me in the piece and I was delighted to see all my interview responses converted to British spellings.